The start of the baseball season is less than a month away. Every weekday until opening day, we'll be counting down, from No. 20 to No. 1, the most important Yankees players for the upcoming 2010 slate. Today, No. 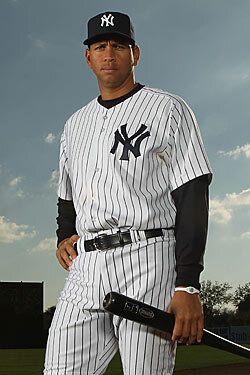 2, third baseman Alex Rodriguez. There are a few ways to look at last season and realize how important Alex Rodriguez is to the Yankees. One could look at how poorly the team played with A-Rod on the disabled list in April and early May, and how their run to the playoffs began almost instantly upon his return to the lineup. (You'll recall he homered on the very first pitch he saw in Baltimore.) To say nothing of the positive impact he had on Mark Teixeira, whose own terrific season didn't really start until he had Rodriguez batting behind him. Or one could look at the 124 games that A-Rod did play, and take note that he still hit 30 home runs and collected 100 RBI even though he didn't appear in his first game until May 8. He may have ceded the title of baseball's best player to Albert Pujols, but he's still an awfully potent bat if he stays healthy. (He needs just 17 home runs to reach 600 for his career.) It's worth noting, though, that he's played fewer than 140 games in each of the last two years. There's a lot riding on his surgically repaired hip. Or one could focus on the postseason, where Rodriguez didn't so much as shake the monkey off his back as he did launch it into orbit: Late, game-tying homers against both the Twins and Angels immediately come to mind, as do his instant-replay homer off the camera during Game 3 of the World Series and his go-ahead double off Brad Lidge the next night. Last year, had A-Rod been in the lineup on opening day — after a spring that brought not just steroid revelations but an unflattering portrayal in Joe Torre's book — we're not sure what kind of reaction he'd have gotten. When he's introduced on April 13, however, there's little doubt that World Champion Alex Rodriguez will hear nothing but cheers. What a difference a year makes.